Jamestown Town Hall is located at 93 Narragansett Avenue, Jamestown, RI 02835; phone: 401-423-7201. Photo: Horsehead-Marbella, ca. 1883, 240 Highland Drive, Jamestown, RI Listed on the National Register of Historic Places in 1999. Photographed by user:Magicpiano (own work), 2014, [cc-by-3.0 (creativecommons.org/licenses/by/3.0)], via Wikimedia Commons, accessed February, 2018. Jamestown [†] occupies all of Conanicut Island in the middle of Narragansett Bay, and is part of Newport County. Providence is about 17 miles to the north. The west passage of Narragansett Bay separates Jamestown from the towns of North Kingstown and Narragansett to the west, while the east passage is located between Jamestown and the communities of Portsmouth, Middletown, and Newport to the east. The distance across the waters of the east and west passages is generally between one-and-a-half to two miles. The shortest distance between Jamestown and the opposite shore occurs at the Dumplings, at the southeastern end of the island, where the east passage is only six- tenths of a mile wide. This strategic site was fortified throughout much of Jamestown's history. The open waters of the Atlantic Ocean, known here as Block Island Sound, wash the rugged southern shores of Jamestown. Conanicut is a long narrow island extending about nine miles in a north-south direction; the east-west dimension is only about a mile. The 9.7 square-mile island is comprised of two parts. The larger northern section is about seven miles long; the smaller section, about three-miles long, known as Beaver Neck, ends at Beavertail Point at the ocean. Connecting these two parts is a low-lying sand bar, about one-eighth of a mile long and about 100 yards wide. For thousands of years before the first Europeans set eyes on the land around Narragansett Bay it was the home of Native Americans. The first contact between the bay area's native inhabitants and Europeans occurred during a brief visit by Giovanni da Verrazano in 1514. A century later the Dutch established New Amsterdam at today's New York City. then extended their sphere of influence eastward along the coast and into Narragansett Bay. Dutch Island was a place of trade for Dutch traders and Native Americans for about 20 years. European settlers from the Massachusetts Bay Colony settled the northern part of Aquidneck Island in 1638 and in the following year started a community at Newport. Newporters leased the rich meadows on several islands in the lower bay for grazing, and sheep were introduced. In 1657 Conanicut Island and adjacent Dutch and Gould Islands were purchased from several Narragansett sachems. After Conanicut was divided among the proprietors, farms were laid out. Ferry service was established linking Conanicut with Newport to the east and the Rhode Island mainland to the west, arid a road connecting the ferry landings was laid our across the island. By 1700 Jamestown shared the prosperity and much of the way of life of the large farmers on the mainland and the residents of Newport. Conanicut's farmers and their slaves raised cattle and sheep, which, with their by-products, especially cheese, found ready markets along the east coast and in the islands of the West Indies, largely through the port of Newport. Jamestown's age of commercial agriculture continued until the onset of the Revolutionary War, when British forces abruptly shattered the island's tranquility. On December 10. 1775. a British contingent wreaked destruction along and near the ferry road and confiscated livestock. Many islanders fled to the mainland until the British occupation of Newport ended in 1779. Following the war, the island's population grew again, and Conanicut enjoyed a long period of rural tranquility. While most of Rhode Island was experiencing the tumult of the Industrial Revolution, Jamestown, with no adequate waterway, remained an agricultural island. Although no water-powered miIIs were ever established on the island, strong and steady winds supplied power for a mill which ground corn into meal. With an economy based largely on sheep, much of the island remained open farmland, mostly pasture, for several centuries. The eastern ferry landing supported a small settlement, but it was scarcely n�ore than a hamlet consisting of a tavern, a few houses, and perhaps a store there is evidence of one dating back to 1773. A steam ferry, which made its first rtrn in 1873, and which replaced an antiquated. wind-powered vessel, offered a swift and reliable passage across the bay and made Janiestown readily accessible from Newport. In the same year that the steam ferry service was inaugurated. land companies platted several tracts of land in the village, near the eastern ferry landing, at Ocean High lands—the former Cottrel I farm along the southern part of the main section of Conan cut—and at Conanicut Park at the northern tip of the island, which was serviced by steamboats from Providence. Shortly before 1900 another residential development, Shoreby Hill, was platted and built. While Jamestown's landscape remained agricultural large tracts including all of Beaver Neck were untouched by' development. Jamestown was also a summer colony' and recreational community, noteworthy for its lishing, its beaches, and its scenery. The village at East Ferry had grown into a small commercial center containing three large hotels, boarding houses, town hail, churches, and several stores. During the Civil War. Dutch Island was acquired by the federal government for a military installation, and in the early years of the twentieth century, the government acquired several parcels of land in the southern part of the island and built Forts Getty and Wetherill. 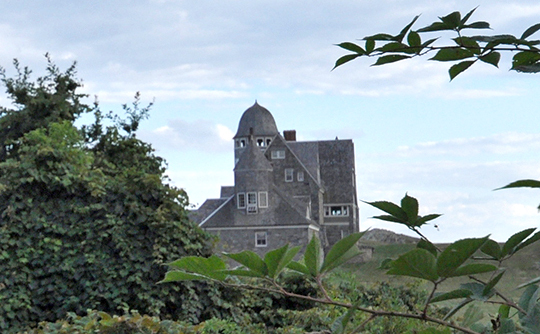 Fort Wetherill took part of the Ocean Highlands tract containing four cottages. Gould island became part of the Newport torpedo station facility in 1918. Aside from the military establishments, Jamestown's growth was slow and steady in the first half of the twentieth century. Gradual population growth did not disrupt the basic land patterns of the island, with its village, summer colonies, and farmland. † Historic and Architectural Resources of Jamestown, Rhode Island, www.preservation.ri.gov, accessed February, 2018.